NOTE: Minor spoilers to follow, especially in the second half of the post, which is a discussion of the way the movie's themes play out in various plot developments. Remember back at the beginning, when I discussed movies, I would often take up the causes of badly-reviewed, popcorn-munching films and unravel interesting elements within them? I've spent more time lately on classic cinema and art film, which makes me happy and all, but now I have to go back to that original Benefit of the Doubt tradition and unpack some meaning in a truly silly, indulgent, pop-culture piece of cinema fluff. Why? Because I insisted on seeing Clash of the Titans for Renegade April. 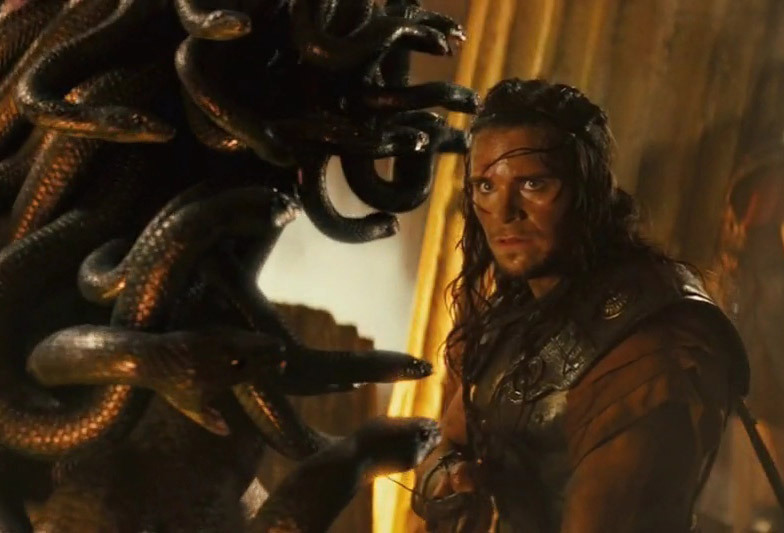 Now, granted, Clash of the Titans, released last weekend and starring Sam Worthington, Gemma Arterton, Liam Neeson, Ralph Fiennes, and a bunch of other beautiful women and scruffy dudes, has a lot of history. First, there's the cinema history of being based on a previous ridiculous action film, released in 1981. Critics like New York Post's Kyle Smith point out that if you're going to do a trashy remake, what better to remake than a trashy original like Davis's stop-motion monster masterpiece? Second, there's the fact that it's based on mythological figures and actual folkloric references, however loosely. Third, there's the blog-wide controversy about the artificial 3D treatment, which caused an uproar among technical purists, dismissiveness among critics, and which probably doesn't really warrant that much discussion, except to say, "Do you think we can spare another three bucks per ticket for bad 3D?" I'd furnish a plot summary, but that's probably not necessary, considering the two millennia of synopses and spoilers that are out there. Also, I'd critique Sam Worthington as an action star, but I think it's a bit superfluous, considering this movie wasn't written or filmed in a way that it could be acted well. Instead, I'm going to talk about the interesting tension between institution and subject, highlighted in the narrative conflict between godly brothers and a demigod son. First, I'd like to point out what I liked about Clash of the Titans. It wasn't the drama, and it definitely wasn't the pacing. The effects themselves were only passable, with their imperfections obscured by the hyperstylization (lens flares, massive color-correction, post-production atmospherics). Among the monsters, Medusa was the least impressive, because she had to be built on an actual human face and body, so her slithering looked exceptionally artificial and computer-generated. She would have benefited greatly from having been designed around costuming and make-up effects, rather than completely built on some designer's desktop. Medusa also had one of the least creative creature designs. It surprises me that every time Medusa is rendered on-screen, she's designed as a beautiful woman, and then tweaked to look dangerous. If I'm not mistaken, the character from folklore would turn men to stone because she was so ugly, which provides the thematic counterpoint with her lost youthful beauty. You can justify her sinister beauty by appealing to continuity from her former self, but this renders her power of ossification a mere magic trick. Meanwhile, female oracles -- women known for their mysterious wisdom -- are allowed to be disgusting-looking, like the Stygian Sisters. Action movies have this classic problem: any female adversary has to be beautiful, perhaps because this is the only way men are able to see women as powerful. This makes movies like Charlize Therzon's Monster especially subversive. Okay, sub-digression over. It's safe to say that Clash is accomplished, at least as a monster movie... its creature designs had an antediluvian malevolence to them, alluding to the Great Old Ones and Tolkien's Balrog, and they escalated beautifully throughout the movie: from giant scorpions to gruesomely deformed sister witches, to a fight with Medusa, a quiet, explosive evil creature that provides a landmark in the journey -- and from there to the Kraken, a triumph of scale and incomprehensible shape and movement, like Matt Reeves' Cloverfield, a monster that was so strange and massive that you could never get the full picture of it. After the Kraken, the banishment of Hades to the underworld is just a formality... the destruction of the Kraken was the real hard work. Still, it the subplot (or maybe meta-plot) with Hades and Zeus that makes for the most interesting fodder for reflection, after all the action has played out. As simple as Clash seems to be, it's easy to forget that it encompasses at least two intersection conflicts. First, there's the explicit conflict between Olympus and Earth, in which Perseus becomes a pivotal figure after Hades kills his family; this is basically a battle of armament and brute force, as Perseus and the Olympians each harness their "greatest weapon" and face off against one another. Second, there's the undercurrent of conflict between brothers Hades and Zeus, which seems to have a lot more intrigue involved. It's worth noting that in this meta-conflict, Perseus isn't a great hero primed to change the universe. If anything, he's a weapon that his father ultimately uses against his upstart brother Hades. Hades helps incite the war against the humans, and he uses it as an excuse to persuade Zeus to empower him: unleashing the Kraken is also unleashing Hades, because the Kraken, a force powerful enough to kill the Titans, is explicitly aligned with Hades. Once Zeus allows this force to be unleashed, he'll be subject to its power, and Hades can depose him as ruler of the gods. Hades has a great plan, but he seems to set it off at the wrong time: Perseus, being a champion among the humans, is positioned to shut down the whole Kraken arms-race before it gets too big for Zeus to handle. There are some real Godly politics here. Zeus and Hades are both part of a rather incohesive governing council, but they have very different philosophies. Hades is rather fascistic, using intimidation and militarism to inspire fear and loyalty in the populace. He's the enforcer, and it's worth noting that he suppresses free speech rather ruthlessly, showing up any time anyone badmouths the Olympians. Zeus, on the other hand, depends on the love and worship and loyalty of the humans (which still sounds a little totalitarian, but better than the "regime of terror" alternative). Zeus is told repeatedly that he has "too much love" for the humans, which is something that you might expect to hear Thomas Hobbes say to Barack Obama. In this sense -- the sense that Zeus tolerates conflict, struggles with the demands of power, and assimilates difference into his worldview -- Zeus represents a more modern social democracy than Hades, for whom fear and obedience are the only successful outcomes. The more flexible and conflicted worldview would presumably be the more vulnerable one, and I think this is the assumption Hades makes about Zeus. However, it's clear that in Clash, Zeus is not easily undermined. In fact, he seems to get the jump on Hades, empowering Perseus ahead of time and giving him the means to disrupt the Krak-attack. When you haven't fully grasped the intersecting conflicts of Clash of the Titans, this is a strange moment, when Perseus discovers a magic sword provided by the gods without any explanation. He represents the humans, right? At war with those same gods? Why would he be getting gifts of war? Perseus assumes it's a trap, but he doesn't realize: his subversion, his resistance to the powers-that-be, are actually a gift to those very Olympians. Perseus can be assimilated, his aggression directed, in invisible skirmishes that he's not even aware of. Zeus the diplomat, willing to extend an open hand even to those who claim to be his enemies, is the one who's capable of harnessing this power. This echoes another great myth, more modern than the Greeks' stories: the myth of Star Wars (episodes IV to VI, that is). 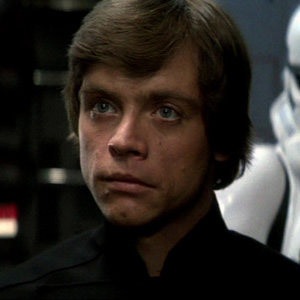 Luke, the hero, is fighting a personal war of self-discovery and vengeance, battling on behalf of his dead family, and in support of a political machine ("the Republic"). However, as a professor once pointed out to me, he's also being used as a tool in a higher-level war, the war between the force and the dark side. As episodes I to III make clear, the previous story, in which Palpatine, Yoda, and Obi-Wan are the major players, encompasses the later story, the personal struggle between Luke and Lord Vader. The deposed champions, Yoda and Obi-Wan, may love Luke as a person, but they don't make any effort to save him from a life of struggle and responsibility -- rather, like any great political ideologues, they train him to fight, and they aim him like an arrow at their enemies. So in Clash, the question of the great cosmic revolution -- humans versus gods -- is generally left open. 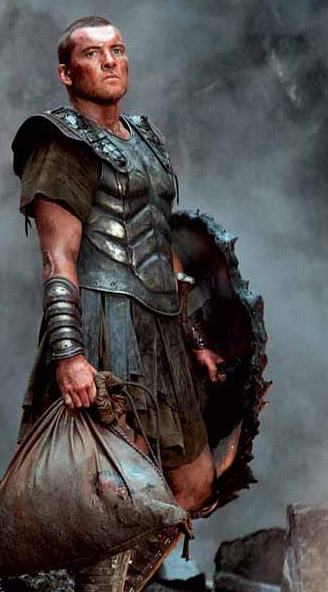 Conceivably, the gods could be deposed by Perseus and the newly-invigorated Greek armies. That statue of Zeus is still destroyed, after all. However, the gods have gotten rid of their immediate problem, Hades' attempted coup. Further, by consolidating their power, destroying the Kraken, and making allies with Perseus, they've presumably protected themselves against revolution for the time being. They did it without totally destroying Argos or murdering anyone's children, royal or demigod. That's good diplomacy, right there. So was Perseus really much of a renegade? Yes, he was, as long as you allow for the outlaw to be considered an integral part of the institutional structure that he opposes. This is the paradox of postmodern power: the only way to keep from being destroyed by subversion is to embrace it. Perseus is the revolutionary, the god-killer, who is ultimately pardoned and adopted as an ally against far more sinister hostility. He's still no government agent, preferring to return to a life of fishing, but he's discovered a path that's parallel to that of the gods he opposes. And so, as always, the renegade becomes an integral part of the health of the society, which must become more open and adaptable as it faces up to its own internal contradictions.